She was born in 1913, a year after the opening of the Museum, to the construction of which her father Alexander Kuznetsov, a founder of the Russian school of industrial design, contributed. She graduated with a degree in art history from the famous Moscow Institute of Philosophy, Literature and History (MIFLI) before World War II, and in November 1943 she defended a doctoral thesis on the history of English portraiture. Kuznetsova authored many books and articles, and put together and wrote essays for many albums and catalogues devoted to French and English art of the 17th-19th centuries. Her greatest academic achievement was a catalogue raisonne of French paintings of the 16th-19th centuries from the Pushkin Museum collection, prepared together with Yelena Sharnova and published in 2001. She placed especially great emphasis on the pictures’ origin and their histories as they made their way through European and Russian collections. Her research was summarized in several major articles - most remain in manuscripts only today - about the history of art collecting in Russia from Nikolai Yusupov to Sergei Tretyakov. We are very grateful to the “Tretyakov Gallery” magazine for this publication of Irina Kuznetsova*, who died in September 2002. The mid-19th century became a critical point in the evolution of Russian art collecting and the life of the country’s museums. Against the backdrop of the period’s public awakening, which included a rise of democratic institutions and the national consciousness, the idea of the originality of the Russian tradition of painting, which necessitated the creation of a national museum, was gaining ever wider popularity. Many private collectors — for instance, Fyodor Pryanishnikov in St. Petersburg or Vasily Kokorev in Moscow — were collecting mostly Russian art. Pavel Tretyakov followed in their footsteps. In the meantime, Russian liberals were raising their voices ever louder against Western art. The most vocal opponents included the Academy fellowship holders in Italy and Paris. All of them — from Vasily Perov to Ilya Repin — yearned to be home again; they were indifferent to the “beauties of local landscapes” and believed that “you cannot make a picture without a knowledge of things that are basic for genre painting — the local people, their way of life, their character — and without a knowledge of typical local personalities”. Repin, who came to Rome in the summer of 1873, praised only Michelangelo’s “Moses”. “The rest,” he wrote, “with Rafael in the lead, are such a childish junk insulting to the eye”. He wrote to Vladimir Stasov from Paris, to where he moved in 1874: “The French paintings today are unspeakably shallow and stupid. The painterly side itself shows talent, but the rest is rubbish. No meaning whatsoever... ‘A Page with a Plate’, ‘A Girl with a Flower’, simply flowers. Life does not exist for these artists — so life is insipid. Their ideas never rise above a petty art merchant’s level”. And further in the letter: “You’re asking me about Delacroix? — I find him disgusting”. 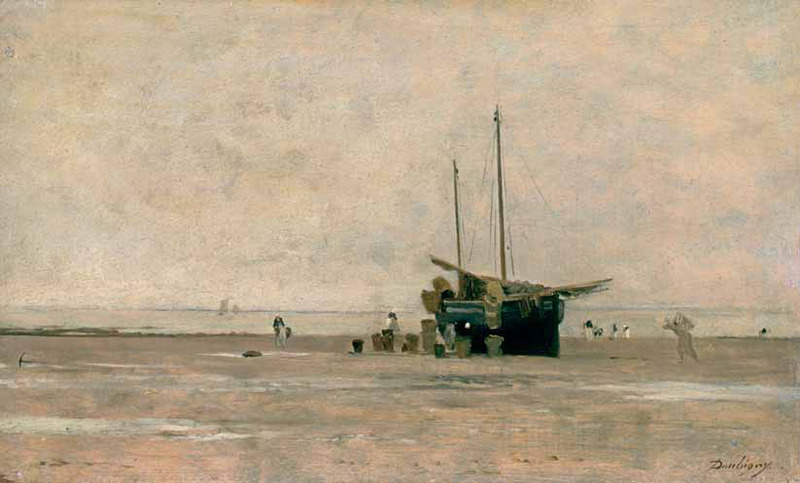 Against this background, the personality of Pavel Tretyakov’s brother, Sergei Mikhailovich Tretyakov, the only major collector dealing with Western European painting in the middle and late 19th century, is conspicuously different. Born in 1834, he was just two years younger than his brother. After they inherited their father’s business, he established an office in Paris in order to expand internationally. Apart from trade, the two brothers shared their interest in art. Both loved music and theatre, and were keen on the art of painting. Already in the early 1860s they became one of the first members of the Art Lovers’ Society, which Sergei Tretyakov was to chair in 1888-1892. Pavel Tretyakov started buying paintings in 1856; as for Sergei he started collecting regularly later, in the early 1870s. The brothers’ areas of interest diverged. Sergei Tretyakov, spending, as he did, much time abroad, became interested in Western art, and thanks to his close contacts with artists and art dealers, and regular visits to Paris shows, he could choose and buy artwork without consulting his brother. Initially, Sergei Tretyakov was tutored in art collecting by the landscape artist Alexei Bogolubov, as well as the writer Ivan Turgenev, an avid art lover who was collecting the work of Barbizon artists, and finally, by Dmitry Botkin, his relative by marriage (their wives were siblings), a collector and enthusiast of French art. It appears that the influence of Turgenev, who, in his own words, was “bitten by the tarantula of art”, became decisive. The writer’s passionate enthusiasm for “the latest French landscapists”, whom he viewed as “number one in the world”, engulfed him completely and could not but infect Tretyakov, who preferred landscapes as well. Alas, as soon as 1878 circumstances forced Turgenev to sell his collection, whereas Sergei Tretyakov’s Barbizon collection continued to grow. Today we often fail to appreciate the innovative and truly revolutionary significance of the Barbizon artists. We tend to forget that for 20 years the Salon jury, time after time, were turning away their works; critics wrangled over them, and Theodore Rousseau, whose art Turgenev loved so much, remained an “unrecognized” artist until his death. Sergei Tretyakov should be given full credit for having immediately recognized and appreciated the achievements of the Barbizon school, and for giving due to its new awareness of nature and the richness of its innovative visuals. Tretyakov’s loyalty to the Barbizon artists never wavered over his lifetime. While non-Barbizon artists are represented in his collection by two or three pieces each, every Barbizon painter is represented by four or more. And these are some considerable paintings! They bespeak the chooser’s most refined taste and subtlest understanding of the artists. 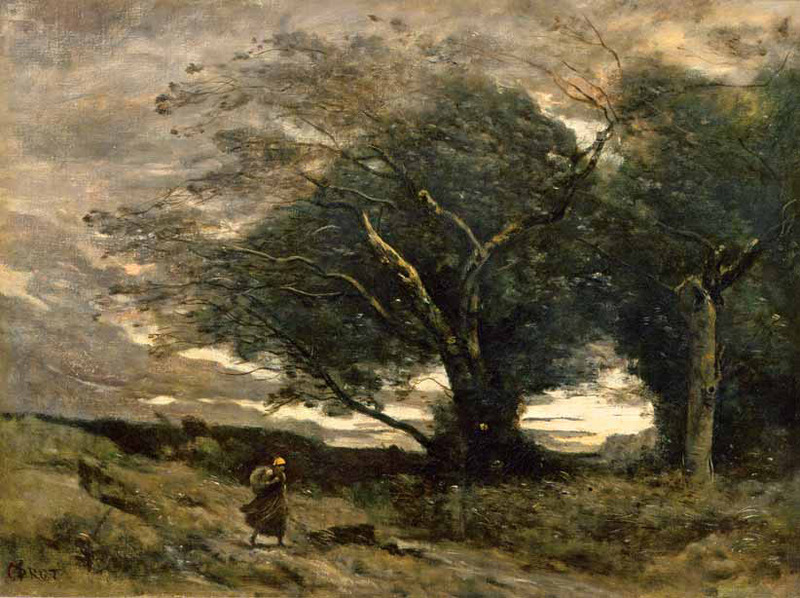 The list of Corot’s works makes clear that it has nothing but the choicest masterpieces: “Heathery Hills Near Vimoutiers” (Sandy Land), “Chateau of Pierrefonds”, “Stormy Weather. Pas de Calais”, and “Gust of Wind” — every piece, marked by a distinctive character and a refined craftsmanship, is filled with a Spring freshness. AH this attests to the collector’s keen intuition and good taste. It should be remembered that the 1870s saw the tradition of Russian national landscape come into its own: Fyodor Vasiliev, Alexei Savrasov, and Ivan Shishkin, whose works Pavel Tretyakov collected in Moscow and who undoubtedly were on his brother’s mind when the latter was putting together his collection of Daubigny and Corot in Paris. True, in spite of his love for the landscape paintings, Sergei Tretyakov was buying at the Salon “fashionable” artists as well, to approve himself to his Parisian friends. 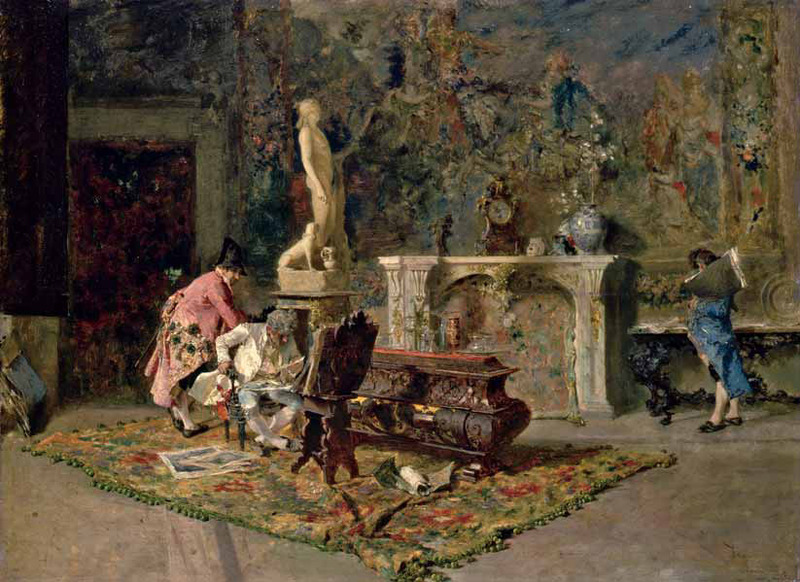 The first acquisitions of this sort included an exotic piece “Oriental Barber’s Shop” by Leon Bonnat, and Ferdinand Roybet’s showy “Page with Dogs”, which he saw in the Salon in 1873. 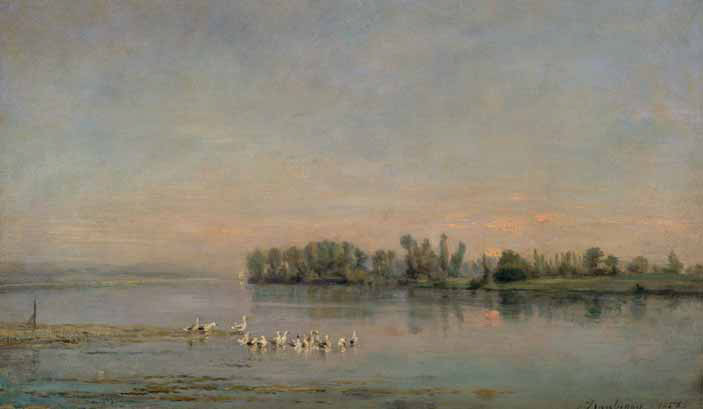 Eugene Fromentin’s piece “Waiting for the Ferry across the Nile”, displayed at the same Salon, was acquired by Tretyakov only later. Unlike his withdrawn, reflective and conservative brother, who always carefully thought and weighed all the “pros” and “cons” before buying a painting, Sergei Tretyakov was impulsive and decisive. As a result, any painting brought to Moscow constantly risked being improved, returned or exchanged. One can only wonder at how much trouble all these endless instructions and orders caused Pavel, for all documents and crated paintings were sent to his Moscow address, to be subsequently placed in the brother’s home on Prechistensky Boulevard. No matter how busy Pavel Tretyakov was managing the firm and dealing with artists, he not only never forgot about these requests but fulfilled them in a most timely manner, informing his vis-a-vis about every detail. A lively correspondence between the brothers in 1882 shows that Sergei was stepping up his collecting efforts. He asked, for instance, to send to Paris pieces by Jules Dupre, Alfred Wahlberg and Theodore Rousseau, because he had “bought a Rousseau from Turgenev, so I don’t need anymore the one I have”. 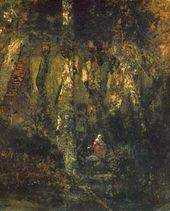 Indeed, in early 1882 Turgenev, in financial straits, had to sell Rousseau’s “In the Forest of Fontainebleau”, his favorite picture and the single Rousseau piece remaining in his collection. The deal was struck and the painting arrived in Moscow, but in November of the same year Sergei Tretyakov sent a new letter requesting several paintings, including the Rousseau landscape, for exchange with “superb pieces by Constant Troyon, Ernest Meissonier and Gustave Courbet”. Ensuing letters shed little light on this sudden decision, but we know that both Troyon’s “Sheep” and Millet’s “Female Charcoal Dealers” remained in the collection, and less than in two years “The Forest of Fontainebleau” was back, about which Sergei apprised his brother: “I got rid of my Rousseau, bought back Turgenev’s”. The vigorous collecting efforts gathered even more steam in the 1880s. 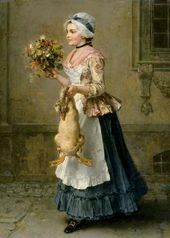 That period in French art was marked by the prominence of the so called “peasant genre”, which many great artists engaged with. Distinct from the harsh truths and monumental might of the already deceased Jean-Frangois Millet, the new school of painting was centered around patriarchal rural life and the unity of people and nature. It seems that Sergei Tretyakov liked the genre, and the wide public interest in it caused him to immediately acquire relevant pieces for his collection. Right after the World Fair in Paris in 1878 he bought Jules Breton’s “Fishermen in Menton”, and a little later, Pascal-Adolphe-Jean Dagnan-Bouveret’s “The Nuptial Benediction”, exhibited at the Salon in 1882. While Jules Breton was a celebrated master who had gained recognition back in the late 1850s, Dagnan-Bouveret was just beginning to win acclaim. 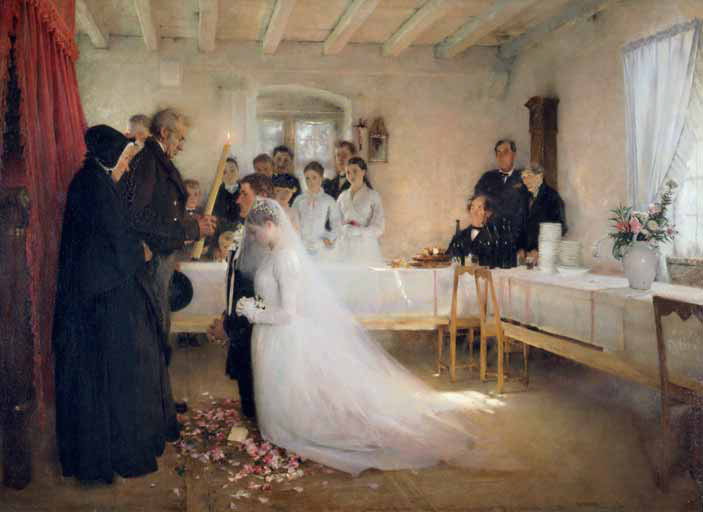 The style of “The Nuptial Benediction” is austere and serene, free of eye-catching details and exorbitant sentimentality. The painting is attractive for its simplicity and focused emotion. Besides, with its array of subtlest gradations of white, Dagnan-Bouveret’s picture evidences the artist’s awareness of the recent visual innovations introduced by the Impressionists. It was not for nothing that Vasily Polenov wrote in 1901 in a letter to his daughter Yelena: “As to [Valentin] Serov’s ‘Vera Mamontova’ and [Ilya] Repin’s ‘Unexpected Return’ — these pictures were probably inspired by Bouveret’s ‘The Nuptial Benediction’”. 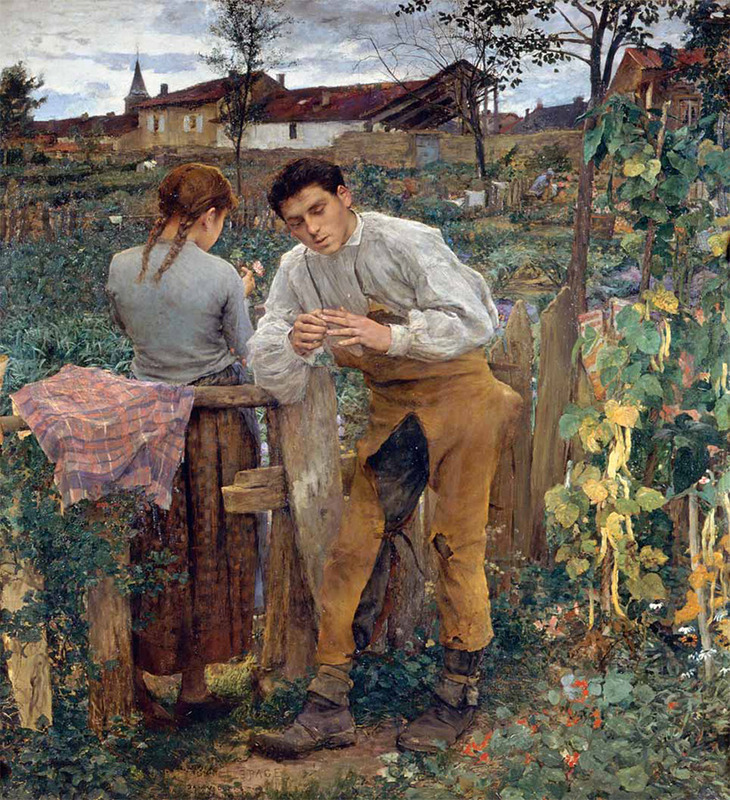 Paintings of Jules Bastien-Lepage, which started to be displayed at the Salon in the late 1870s, captivated viewers at once with their sincerity and expressiveness. His picture “Hay Making” (1877, in the Louvre, Paris), in the tradition of Millet, was widely reviewed and brought him into the public eye. It did not take long before he caught the attention of Russian artists as well — Ilya Repin, Mikhail Nesterov, and Valentin Serov. 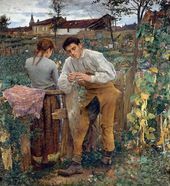 But whereas Repin’s response, generally positive, had some critical barbs attached, the younger artists — Nesterov and Serov — were literally shaken. When, in 1889, the World Fair exhibited Bastien-Lepage’s piece “Joan ofArc Listening to the Voices” (now at the Metropolitan Museum, New York), Nesterov came to the show every day and spent hours looking at it. Valentin Serov, in turn, wrote to Ilya Ostroukhov on September 16 in the same year: “I was delighted to see at the show Bastien- Lepage’s work — he is a good artist, probably the only one whom I remember well and remember with pleasure”. Sergei Durylin wrote that when Sergei Tretyakov’s collection was held in the mansion on Prechistensky Boulevard, Serov used to tell him: “Every Sunday I go there to see ‘Village Lovers’. And Serov knew what to set his sights on, he knew even when he was a young man”. The fact that Bastien-Lepage’s paintings impressed two outstanding Russian artists so greatly tells a good deal about his artistic impact. The artists from the “Peredvizhniki” (Wanderers) society, who, in the 1860s-1870s, championed the idea of the public mission of art, later became more interested in the inner world and spiritual aspirations of the individual. The Russian Realist school of painting changed, producing such portraits as Valentin Serov’s “Girl in the Sunlight”, and such paintings as Mikhail Nesterov’s “The Vision of the Youth Bartholomew”, a piece obviously inspired by Bastien-Lepage’s “Joan of Arc” which Nesterov had seen. Our artists admired the French painter not only for the new emotions he conveyed, but also for the richer visual language, such as the treatment of plein air in a decorative vein; Nesterov’s pieces evidence a great impact of this approach. On the whole, “Village Lovers”, acquired by Tretyakov, not only was a valuable French addition to the collection, but also played an important part in the development of contemporary Russian painting. 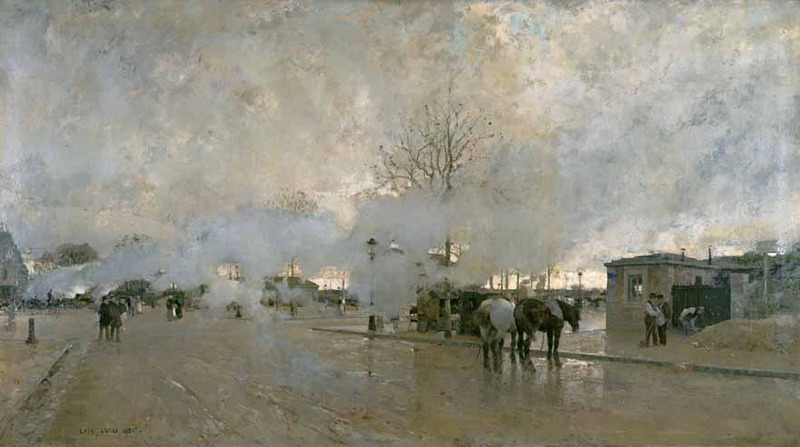 1885 also saw the acquisition of a large painting of the yet little-known Luigi Loir “Smoke on the Paris Circuit Line”, which enthralled Russian artists with its subtle colour scheme of the shades of gray representing clouds of smoke haze trailing past dingy buildings. The piece set off a heated argument and brought up many conflicting opinions, and its idiosyncratic artistic message clearly suggests that Sergei Tretyakov was interested in modern colour innovations. In 1886 Tretyakov, all of a sudden, added to his collection Eugene Delacroix’s “After the Shipwreck” (1847), which, 40 years after its creation, was already an acknowledged masterpiece. We believe that this small piece, with its bluish plumbeous palette and disquieting solitary sparks of white and red, and a wrenching sense of utter desperation, is more expressive and more typical for Delacroix’s genius than his “Moroccan” pieces from the Hermitage collection. That was a first successful attempt to tackle those works of French art of the 19th century that were already recognized as classics, and to buy it for the collection. However, the next (1887) year, Sergei made another surprising move — he requested his brother in Moscow to send to Paris a painting of Jean-Baptiste Isabey (which one is uncertain), which he had “exchanged for a very good Lawrence Alma-Tadema’s piece”. Alma-Tadema’s “Fredegund by Praetextatus’ Death Bed”, painted way back in 1863 in a style similar to Dutch primitive artists, was awarded a gold medal, and next year, raffled off at the Salon in Brussels; it won the artist a huge sum of money and European fame. It is not certain from whom Tretyakov bought the picture afterwards. The piece marked a watershed in the artist’s career. When he completed it, he moved to England, focused on antique themes and completely changed his style of painting. 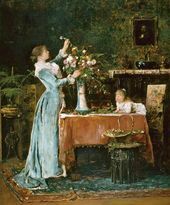 Apparently, there were doubts and difficulties accompanying the purchase of the piece, for it arrived in Moscow not in 1887, as one would expect, but in 1891, a short while before the owner’s death. It is worth noting that “Fredegund” is Alma-Tadema’s sole painting to be found in Russia. Sergei Tretyakov passed away before he could realize all of his plans - he died in 1892, before he could set his eyes on the latest acquisitions, which were brought to Moscow after his death. The collection of Western European art he put together included 84 works representative of different schools. The works of the French school, which made up three quarters of the collection, were undoubtedly the centrepiece. Besides, the collection had 15 pieces by German artists, five by Dutch, and three by Spanish, including “Snake Charmers”, a picture by the favourite painter of many Russian artists Mariano Fortuny, which was acquired for the dizzying sum of 110,000 francs." On the face of it, it seems very strange that the collector neglected the Impressionists, for they were his contemporaries in every full sense of the word. One would think that Sergei, out of curiosity if nothing else, could have visited their first exhibition in 1874. But he did not. The camp of staunch opponents of Impressionism included the advocates of traditional academism as well as aficionados of Realism, itself a recently recognized trend, and the late 19th-century Symbolists, who were on a spiritual quest. Considering that Sergei Tretyakov was raised on the art of the Wanderers society, how could he have bought the works of Edgar Degas or Claude Monet? Ivan Morozov and Sergei Shchukin would dare such a buy only 10 years after his death, but these collectors belonged to a new generation — they were younger than Tretyakov by 36 and 20 years, respectively. Assembled abroad, pivoted towards works of non-Russian artists, the collection of Sergei Tretyakov, however, has a subtle but definitely felt kinship with his brother’s famed gallery. Maybe this is because his collection is dominated by landscape pieces, whose lyricism, cordiality and simplicity echo Russian landscape paintings of the period. Like the gallery, the collection has no pompous paintings or paintings centered around abstract mythological themes. Even the genre pieces seem to have something in common with certain well-known paintings from the Tretyakov Gallery. Tretyakov’s collection of French art became a Russian collection, and this is what makes it distinct and special! In Moscow the collection was treated with respect by connoisseurs and loved by artists. Vasily Polenov sent his students “to Prechistensky Boulevard to see the French and the Spanish [artists]”, because Tretyakov’s collection was the only place where they could see the modern European painters. Presently, nearly all of Sergei Tretyakov’s collection is held at the Pushkin Museum of Fine Arts, with the exception of several pieces handed over to the Hermitage museum after the State Museum of New European Art (GMNZI) was shut down [in 1948]. Nearly all the paintings are displayed in the gallery of the art of Europe and America of the 19th-20th centuries, forming the backbone of the section. Had it not been for this collection, we would not own the artwork of such masters as Eugene Delacroix, Jean-Frangois Millet, Camille Corot, Theodore Rousseau, Charles-Frangois Daubigny, and Jules Bastien-Lepage; the entire period between the First Empire and the Impressionists, with its best artwork missing, would have lost all sense for us. So, in this context, one can hardly overestimate the impact of Sergei Tretyakov’s collecting enterprise and his huge contribution to the cause of collecting Western art. Publication prepared by Svetlana Zagorskaya. * This article is based on Irina Kuznetsova's published study “Sergei Mikhailovich Tretyakov's collection of Western European art" (“Private collecting in Russia" - Papers presented at the Vipper Conference - 1994, Pushkin Museum of Fine Arts, Moscow, 1995) and the original, prepublication (expanded) version of the article. The article was edited and abridged for the present publication. World history of art. Moscow, 1964, Volume V, p. 201. Stasov, Vladimir. Selected works. Moscow - Leningrad. 1950. Volume 1, p. 76. Tretyakov Gallery Manuscript department. Fund 1, unit 3661. Tretyakov Gallery Manuscript department. Fund 1, unit 3666. Tretyakov Gallery Manuscript department. Fund 1, unit 3674. Valentin Serov: memoirs, journals, contemporaries' correspondence. Leningrad, 1971. Volume 1, p. 122. Durylin, Sergei. Mikhail Nesterov in art and life. Moscow, 1965. p. 133. “Relating to us his visit to Leo Tolstoy at Yasnaya Polyana, where they talked about painting, Nesterov told us about his admiration for the same painting of Bastien-Lepage. Given its impact and the innermost profound meaning, “Village Lovers" is more Russian than French. A wedding ceremony would be even more touching and efficient in front of the painting than in front of the icons, which often lack soul.” See: Nesterov, Mikhail. In the days of yore. Moscow, 1959. p.276. Alexander Benois wrote: “AH Russian artists were mad about Fortuny, saying his art was the ultimate achievement of the craft of painting " In: Benois, Alexander. My memoirs. 5 books in 2 volumes. Moscow, 1980. Books IV-V, p. 42. Théodore ROUSSEAU. In the Forest of Fontainebleau.